Is Wyoming's Red Desert A Wilderness Or A Wasteland? The northern Red Desert is crisscrossed with user-made roads, an impediment to securing a wilderness designation. When I was a kid, my dad worked in an oilfield somewhere near Killpecker Sand Dunes in the northern Red Desert near Rock Springs. One day, my brother and I got lost out in the sand. One of my dad’s fellow roughnecks had to come rescue us. So I am a little nervous in the Red Desert. But today I’m conquering my fears. I’m flying in a tiny plane crammed with five others over those very same sand dunes. The wind moves these sand dunes, a ribbon of yellow that seems to go on forever in both directions. Beyond is the iconic notched shape of the Boar's Tusk, a single rock jutting up on the plain. Nearby, tiny dots graze: wild horses. The southern Wyoming’s Red Desert is treasured for different reasons by different people. For some, it should be left alone for its natural beauty. For others, it should be open to use for its bountiful resources like its natural gas and livestock grazing. But those two different ways of seeing the desert can create conflicts with how to manage it. And that’s put the Bureau of Land Management in a tight spot as they tackle a new broad scoping resource plan that’ll last two decades. Much of the land is currently open to development, but conservationists like Kyle Wilson want to see that plan include more protected wilderness areas. In fact, Wilson says, it’s home to a rare herd of desert elk as well as the longest mule deer migration route in the world, which brings them from the Wyoming Range all the way down to winter here in the Red Desert. But while it might not have fences, the Red Desert does have plenty of roads. From above, I see them crisscrossing everywhere, no destination in sight, except gas wells. The Red Desert is the most misunderstood landscape in Wyoming. I've heard from many people who drive through Wyoming that that part of the state is a wasteland. And it's completely the opposite of that. Over the roar of the engine, Wilson says, “You really get an idea of how many roads are out here when you look from above. And it's the number of roads that’s the biggest block to convincing the U.S. Congress to designate the northern Red Desert's nine study areas as true Wilderness with a capital W, a title reserved for only the most pristine lands: no human structures, no machinery, no wheeled vehicles...and no roads. Wildlife biologist Erik Molvar is the author of Wyoming's Red Desert: A Photographic Journey. About 3% of the northern Red Desert qualifies for wilderness status. The rest of its 3.5 million acres is already too developed for that designation. But Molvar is worried energy and mining development could encroach on even that 3%. He says the BLM doesn’t even require energy companies to get approval before building more roads. But BLM Rock Springs Field Manager Kimberlee Foster says making these lands available to energy development is part of their mission, too. Foster says she doesn’t know what the upcoming plan will include, but she does know a lot has changed in the last 20 years: sage grouse almost went extinct, the energy industry developed new highly efficient extractive technologies, and the longest mule deer migration route was discovered. She says whatever decisions are made in the new plan, they won’t have a chance to be revised again for twenty years or more. Foster says, that’s means they have to think long-term for everyone with a stake in the area. Foster says her office will release a draft of the plan in 2017 for public comment. Wilderness advocates hope the public speaks up, even though they also recognize that making a case for the Red Desert as a pristine wilderness could be a tough sell. For one thing, most folks have just been in a hurry to get to the other side, whether pioneers on the Oregon Trail or motorists on I-80. Like me, a little nervous about getting lost in all that wide open space. Wyoming’s Red Desert has become an increasingly popular destination for nature photographers. Dan Hayward has been taking pictures of that vast landscape—from the ground and from the air—for three years. On Friday, he’ll present his work in a slide presentation at Central Wyoming College in Riverton. 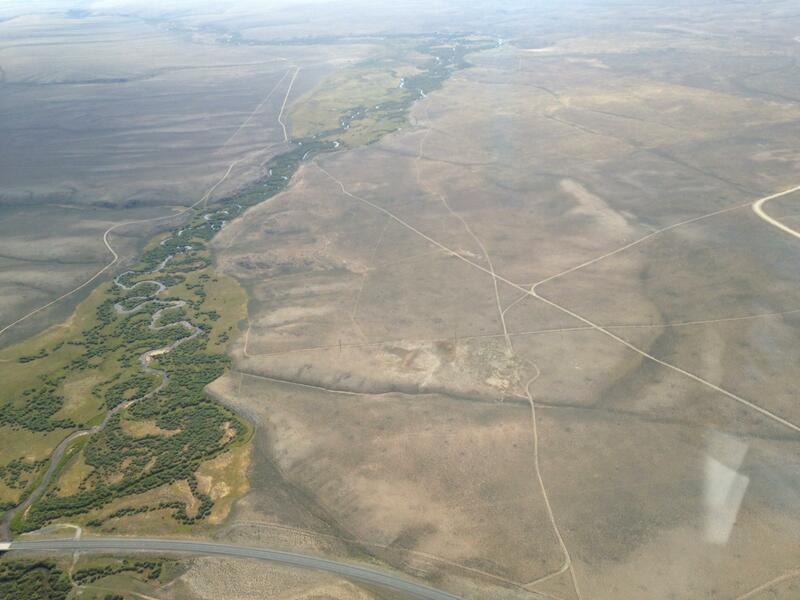 Wyoming Public Radio’s Micah Schweizer spoke with Hayward about his work in the Red Desert. The Bureau of Land Management is considering protecting some areas in the Red Desert because of their scenic qualities. The agency’s Sheila Lehman says they’re considering amending the Rawlins Resource Management Plan, to limit development on parcels of land with important wilderness characteristics. “There’s the potential to maybe be able to preserve it a little bit more, or by mitigating certain things to keep that quality – that wilderness quality,” Lehman said. Protestors say the BLM office in Montana is trying to wipe out the state’s last herd of wild horses. That herd lives in the Pryor Mountains in Montana and Wyoming. The group marched into the Billings Field office recently, demanding the agency abandon plans to round up horses and use birth control on the mares.